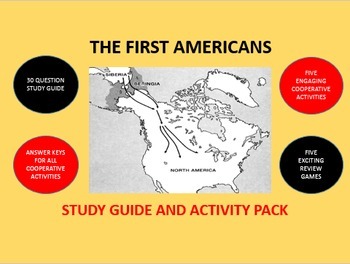 Generate excitement and engagement in your classroom as your students learn about the history of the First Americans. This packet has a 30 question Study Guide covering THE FIRST AMERICANS. 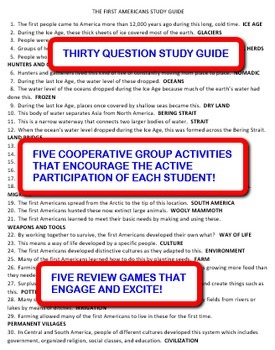 I have included five highly interdependent cooperative group activities using the STUDY GUIDE. They are structured to motivate students to be engaged with one another as well as content. Five different games are also included. You are shown how to play all of the games with the STUDY GUIDE provided. Every game is fast-paced and generate a lot of enthusiasm from students. 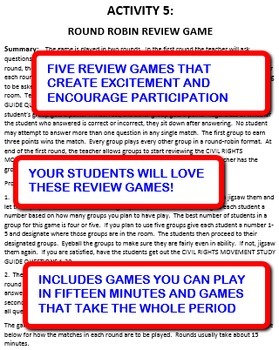 After playing them, you will see that you can use the structure of these games for any classroom content. Every cooperative group activity and game comes with full instructions and the sheets needed to do them in the classroom. All activities come with Answer Keys.